Welcome to the Pioneering section. Pioneering involves the process of designing and constructing equipment for practical uses. This can range from a simple washstand for your bowl to a cantilever raising bridge across a river. Pioneering requires a familiarity with knots and lashings and their appropriate use. With the more ambitious projects teamwork and forward planning will be welcome additions to the pioneers skill set. 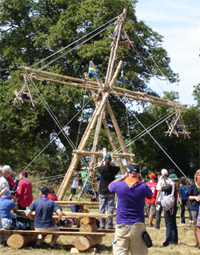 For Scouts pioneering can serve many practical and useful purposes. A lengthy camp will be made all the more comfortable with the addition of gates, benches, tables, washstands, dressers, showers and other items. Pioneering can be great fun, simple monkey bridges and aerial runways can be as much fun to build as they are to use. Using your skills to construct a bridge across a lake can serve both the enjoyment and practical sides in one go. You certainly learn how to tie your lashings properly once you have walked over a bridge and have it collapse under you!